Does this sound familiar? You urgently need to write down something important - a telephone number or details of an important meeting - so you use whatever you can lay your hands on: a piece of paper, a scrap of newspaper or the first computer text file you come across. The important note is recorded, and the issue seems to have been resolved. But just when you thought it was OK, you discover the note is needed again only to find that it is buried somewhere under a pile of similar scraps, while the temporary text file has been moved to trash or lost somewhere on the network disk of an unknown server. To help prevent this situation, we have launched Personal Organizer / Notes Manager software: Exstora Pro and Exstora Freeware, designed to assist you in note taking and organizing your information. With Exstora, you can write down a thought that comes to your mind as soon as possible. To create a new note, just double-click next to the corresponding section. 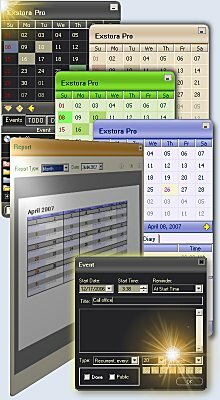 Scheduling events and creating plans for the future has never been easier and more comfortable than with Exstora personal organizer (PIM). Just select a date in the built-in calendar and double-click it to enter the scheduled event or TODO item. Gantt Chart Planner. One-time, long-lasting and repeated events are supported. It is really easy to create a diary in Exstora: open the Diary tab and type the interesting things that happened today. Running the program from a flash drive allows you to always have your data at hand, while the optimized code is very compact and the program will not take much space. If you need to quick arrange notes or events, just capture the note or event you need and drag it to the necessary section (notes) or to the necessary date (events). The built-in RSS/Atom Reader will download the news you are interested in and carefully save them to your personal database. Keep your contacts in one place with TODO, Diary, and Events. Import contacts from your mobile phone or Outlook. Exstora supports importing vCard files (.vcf). The report manager will allow you to print out (create a hard copy) of your plans, diary or notes, while the built-in feature of importing and exporting iCal files will allow you to synchronize your personal data from the Exstora organizer with most of the popular organizers software. "Congrats for the sleek, no-nonsense, intelligent and stylish software. It's the most user-friendly I could find in 5 hours of Internet search." "I think your organizer is very well thought out, The layout is very user friendly, and it is very memory efficient." "...I especially admire it's small disk size and interface design."